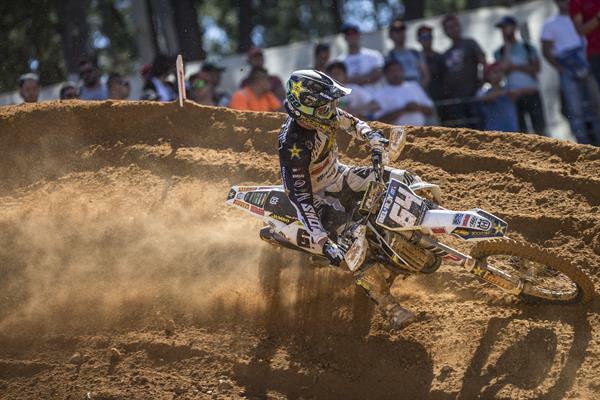 Claiming a start to finish qualifying race victory and then going on to earn two top three moto results, Rockstar Energy Husqvarna Factory Racing’s Thomas Covington wrapped up round 12 of the FIM Motocross World Championship earning third overall in the MX2 class at the GP of Portugal. The MXGP of Portugal proved to be a challenging one for all competitors due to changing track conditions and soring temperatures. Getting an early lead and never looking back during his qualifying moto Covington placed himself on pole for Sunday’s final motos. Getting good starts and leading the way in the opening part of both motos the American collected a pair of third place results ensuring a strong third place overall result. Showing good speed in both MX2 races, Covington’s Rockstar Energy Husqvarna Factory Racing teammate Thomas Kjer-Olsen suffered a few mistakes that prevented him from battling for the overall podium. Earning fourth in moto one and then fifth in moto two the young Dane wrapped up the GP with a strong fourth place in the 250cc class. Getting good starts in both motos Rockstar Energy Husqvarna Factory Racing’s Conrad Mewse was frustratingly unable to keep up with the leading group during each race. Collecting 17/19 results the Brit rounded out the GP with 19th overall. In the MXGP category, Rockstar Energy Husqarna Factory Racing’s Max Nagl was involved in a great fight for the overall podium until the closing laps of the second moto. Getting the runner-up spot in the qualifying race, the German secured a good starting position for the final motos. Racing in third for most of the opening race, Nagl settled for fourth at the finish. Starting strongly in second during the second moto he finished fifth in race two. Fresh from his first career podium result last weekend in Italy, Max Anstie was hoping for equally positive result at the Agueda track. Getting 10th in moto one and then eighth in moto two the Brit earned ninth overall at the GP. Involved in some great battles during both motos Gautier Paulin secured 12/11 results for 12th overall at the GP. The Rockstar Energy Husqvarna Factory Racing team will return to action at round 13 of the 2017 FIM Motocross World Championship in Loket, the Czech Republic on July 22/23. Download all high-res images from the MXGP of Portugal here.